Wildlife art is largely derided by the art ninny crowd, and with good reason. So dreadful is the majority of our genre's output, that many who should know better have learned to dismiss automatically artwork depicting wild animals. A brand new book seeks to address that problem and to analyze just how wildlife art, or more specifically, bird art, functions. 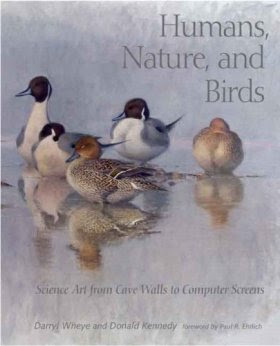 Co-authored by Science editor-in-chief/former Stanford University president Donald Kennedy and scientific illustrator/writer Darryl Wheye, Humans, Nature & Birds--Science Art from Cave Walls to Computer Screens includes 69 images of birds with analyses of each. The artwork spans the temporal range from Cro-Magnon artwork from Chauvet to artwork of the 21st Century, and is presented in the form of a virtual gallery exhibition where the work of classic bird artists like Audubon, Fuertes and Sutton hang beside masters not usually thought of as "bird artists," like Leonardo, Andrew Wyeth, Magritte and Manet, and contemporary bird painters like Bateman, Brenders and Harris-Ching. It's the accompanying text, though, that makes this book stand out. Well researched and cited, each image has been selected to illustrate a facet of the book's theme, ultimately building a powerful case for a better understanding of bird art, and by logical extension, of biological and science art in general. 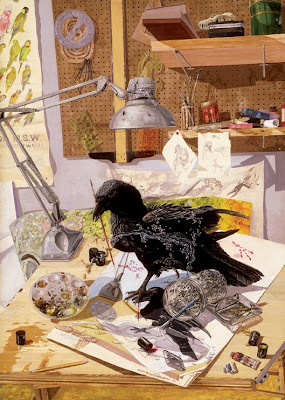 Among the work included is my painting, "Two Stories--Common Nighthawk" (above). A website is currently being built where browsers can find out more about the book and explore its pages. Thanks to Rob over at Birdchaser for his post linking to an interesting account of an “albino” Golden Eagle, along with some spectacular photographs. While I would have loved to swipe one and post it, I decided instead on the above watercolor of a white phase Gray Goshawk (Accipiter novaehollandiae). This common Australasian bird normally looks like the fellow on the right, but a morph occurs with completely white feathers--right down to the wingtips. Not all populations carry the potential for this phase. Usually, white plumage is a liability for a predatory bird, especially in tropical forests. 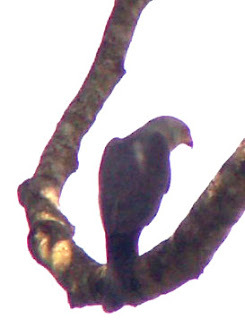 Conventional wisdom suggests the white Gray Goshawks realize a benefit from their similarity to white cockatoos (Cacatua spp. ); small prey birds are likely to mistake them for the innocuous psittaciformes until it's too late. In fact, the white phase is not known to occur in any localities where Cacatua species don't. White phase Gray Goshawks look very much like albinos--right down to the red eyes they share with their entire species, but true albinism is rare in raptors. The North American Red-tailed Hawk (Buteo jamaicensis) is the only species I know of where the trait crops up with any regularity. The plumage of the Holarctic Gyrfalcon (Falco rusticolus - left) ranges the spectrum from nearly black birds to ones that approach the pallor of an albino Redtail or white Gray Gos. Any biogeographical trends to Gyrfalcon color phases are harder to see, although the whitest birds are said to come from Greenland. Pigment impoverishment can result from several types of genetic mutations: albinism, leucism, hypomelanism, etc. These various conditions differ in the types of pigment cells that are affected, and are especially well-known to herpetoculturists, who, in recent years, have developed dozens of color varieties of numerous reptile species by selectively breeding from rare mutants like the Burmese Python (Python molurus) pictured below, which was wild-caught last year in northern Bali. Leucism and similar traits are normally thought of as purely genetic in origin, but it seems possible to me that there could be a nutritional aspect to some cases. Back in the '70s, a couple of friends and I trapped an unusual adult female Prairie Falcon (Falco mexicanus) that had been hanging around downtown Salt Lake City. Her plumage was very white--similar in appearance to a light-colored Saker (F. cherrug). Not only were her feathers unusual in color, they were very poorly-formed, with weak barbs. She was in a very emaciated condition when we caught her, and it wasn't clear to us whether her thinness resulted from poor feather quality or vice versa. A pair of jess anklets and a band on her leg though, held a clue. It turned out she had been trapped two years earlier (she was a first-year bird then) by another falconer who had flown her for a couple of months before losing her. He reported that her juvenile plumage had been perfectly normal. The original trapper transferred the bird's permit to my friend, but she unfortunately died of Trichomoniasis before her next moult. A few years later an apprentice falconer of mine trapped a similar Prairie Falcon, this one an adult male (below). He was also quite starved, but since the trapping of mature falcons was illegal, we made the decision to feed him up for a couple of weeks then release him, probably to his demise. I wish we could have kept one of these falcons through the moult to see if the feathers would be replaced by normal ones once their owner was back in good health. The eagle captured in Colorado is said to have been so thin that he couldn't fly. From the photographs, his feathers look to be in the same shape as these Prairie Falcons. He is being treated at a rehabilitation center, and the report states that he's expected to be returned to the wild in about three months. Should this plan be carried through, I'd predict one dead, white eagle in Colorado by New Year's. I'd expect any zoo director to happily take responsibility of such an unusual and beautiful bird for a year or more, and keeping him through his next moult would not only increase his chance of survival, but possibly add to our knowledge of avian pathology. upper: WHITE PHASE GRAY GOSHAWK (1996) watercolor 11.5" x 8.5"
second: SILVER GYRFALCON PORTRAIT (2005) acrylic 15" x 7"
Whenever Darren Naish blogs about owls, I end up with far more to say than can be politely typed into a comment space, and once again a short post from him inspires a lengthy one over here, and a chance to post some really old paintings. As usual, Darren's brief essay about the function of owl ear tufts was packed with information as well as interesting comments from knowledgeable people arguing for or against one of three possible tuft functions. The first of these suggests that they lend owls a mammal-like visage that is more likely to intimidate mammalian predators. The second possible function concerns species recognition and other intraspecific signaling, and the third is camouflage. Like Darren, I find the last suggestion the most plausible, but let's examine why. When mentioning feathered ear tufts, owls are the first birds to come to mind, but they're hardly alone. Paired head tufts have developed independently in cormorants, pheasants, puffins and others, including numerous groups of perching birds, culminating in the outrageous head plumes of the King of Saxony Bird of Paradise. Their uses vary from taxon to taxon; the function of the King of Saxony's plumes is obvious. Those of the two above, the Horned Lark (Eremophila alpestris) and Inca Tern (Larosterna inca), are harder to explain. Ear tufts adorn the heads of several related owl genera, including the screech and scops owls (Otus*) and the eagle owls (Bubo**). Practically all of these owls have ear tufts, while members of all other genera lack them, with the exception of the Asio owls, all of which are eared, and not closely related to the other eared owls. The roots of three odd horned owls are unsure, but the Jamaican Owl (Pseudoscops grammicus) is probably related to Asio, while the Neotropical Crested Owl (Lophostrix cristata) and the African Maned Owl (Jubula lettii) are possibly allied to Bubo, as are the oddly tuftless African fishing owls (Scotopelia spp.). In his post, Darren mentioned a new paper describing ear tuft erection as an alarm response in Ferruginous Pygmy Owls (Glaucidium brasilianum)!! The tuftless barn and bay owls of the family Tytonidae differ so much from typical owls in form and behavior as to limit their relevance to this discussion. I'll only mention that the odd facial disc apices of the Asian Bay Owl (Phodilus badius) look rather like proto-ear tufts to me. A few nightjars and owlet-nightjars also sport tiny ear tufts. So what do they do? First, let's consider the case for the mammal-mimicking threat. My own observations throw some doubt on this one. The Harpy Eagle (Harpia harpyja - above) is the only bird I can think of whose behavior conforms to this theory. Its cat-like double crest is erected fully when the bird threatens, but why this adaptation would manifest itself most strongly in the one bird species best equipped to defend against mammal attacks, I can't imagine. As far as I know, ear tufts are never important in owl threat displays. These displays are most valuable to fledglings, most of which leave the nest some time before they can fly, and it must be noted that all tufted owls start out as tufted as juveniles as well. Owls' first plumage differs substantially in structure from the adult plumage, which typically comes in before the bird is one year old, and juvenile “horns” are often morphologically very different things from their adult analogs, so they're obviously important to young birds. Still I've never seen them used to threaten. The two photos (below) of a young Great Horned Owl (B. virginianus) show typical behavior. At left, the fledgling erects his horns and adopts a cryptic pose when startled by my approach. Once I get very close, his attitude becomes defensive, and the horns begin to lower (center), and continue to do so as the threat intensifies. The painting at right shows two young birds in similar poses. Within the genera of typically tufted owls, it's instructive to look at the tuftless ones. 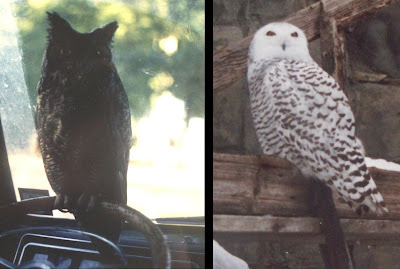 All members of the genus Bubo have well-developed ear tufts (above, left), except for the Snowy Owl (B. scandiacus - above, right), the only one that lives mostly in open, treeless areas, roosts on the ground and is diurnal. Even juvenile Snowies show no vestiges of ear tufts. It's interesting that Great Horned Owls vary greatly across their range in form. In moist, heavily forested regions they're big and dark, with large feet and narrow wings, while desert birds are small and pale with broad wings and tiny vole-catching feet, and arctic birds are massive and whitish. Nowhere, though, are their ear tufts reduced in the least. Several Otus species have greatly reduced ear tufts, though, and most of these occur on islands or high mountaintops with few or no mammalian predators, giving a bit of credence to the Mammalian threat theory. The tiny ear tufts of the peculiar little Flammulated Owl (O. flammeolus - below) of the Rocky Mountains are usually not visible in either juveniles (left) or adults (right). It's only when the birds are roosting in cover that they're elevated into visibility. It's the Asio owls, though, that best illustrate tuft development trends. The seven members of this genus are pretty uniform, but the ear tufts of two species are reduced to stubs. The Long-eared Owl (A. otus - below, left) and Short-eared Owl (A. flammeus - below, right) are well-known and widespread. Their habits are similar, but the Shortear is more diurnal and normally roosts on the ground. It seems likely that the same factors oversaw the loss of ear tufts in both the Shortear and the Snowy Owl. Even though its diminutive horns barely affect its silhouette (left), the Shortear moves them in the same fashion as its better-endowed kin, erecting them to their full puniness at a minor disturbance. Unlike the Bubo and Otus owls, members of the genus Asio erect their ear tufts when in full threat display. Their effect is normally obscured, though, by the bird's wings (more on this later). It should be noted that juvenile Shortears have well-developed horns; it's hard to distinguish one from a young Longear. 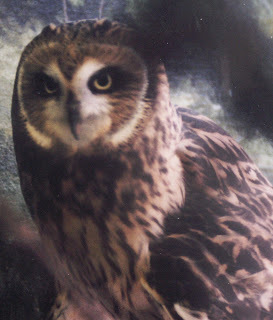 The other earless Asio species, the African Marsh Owl (A. capensis) is a little more problematic. In habits, it lies between the Shortear and the Longear, flying by day and night and exploiting a number of habitats, some of them rather well wooded. There is some controversy regarding the African Marsh Owl's phylogeny, and it's not clear whether it lost its ear tufts along with the Shortear or independently of it. If this could be established it would shed some light on the puzzle of tuft development. In fact, working out general owl phylogeny will be an important step in understanding this issue. For instance, there's fairly good molecular evidence that Bubo is a more basal genus than genera like Strix and Ciccaba (usually conflated, nowadays). Demonstrating that these nocturnal, deep-woods birds were derived from tufted owls would force some intense re-thinking on many of us. The second hypothesis of tuft function suggests that they lend owls a characteristic silhouette identifiable to conspecifics. Since owls are mostly nocturnal and recognize one another by vocalizing, such lavish adaptations seem unlikely, and since there appears to be a correlation between diurnal habits and loss of horns, I tend to dismiss this idea. It's also been suggested that ear tufts are employed in more complex intraspecific communication. When interacting with a horned owl, it's tempting to ascribe emotive intentions to tuft movements, but this is probably more a case of projection than discovery. Owls are mostly solitary, and the most gregarious species like the Burrowing Owl (Athene cunicularia - above) tend to be earless. Burrowing Owls do communicate visually, though, by expanding and contracting the two white fields beneath the facial discs. The previously mentioned Flammulated Owl is one of the most social Otus owls -- also with reduced ear tufts. In certain cases, Long-eared Owls are colonial. It would be interesting to spend a spring in one of these colonies with a pair of night-vision goggles. Most owls have an extended dependency on their parents, and the possibility persists of tuft use in parent-fledgling signaling, not to mention courtship displaying. Again we're limited by our diurnal eyes. It seems clear to me that whatever other uses owls put their tufts to are secondary to hypothetical function #3: camouflage. When erected, they disrupt the bird's outline, making it resemble a broken snag. 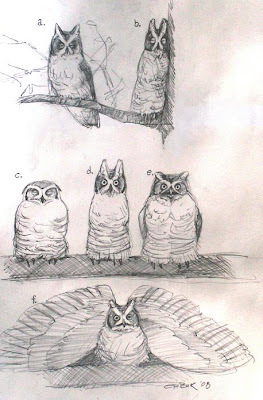 The sketches above show typical roosting postures of eared owls. Figure a. shows the typical posture of an owl roosting in moderate cover. In heavier cover, tuft erection tends to be more extreme. The base of a limb is often selected (b. ), and the bird often leans into the trunk, extending body and ear tufts to their fullest, as if merging with the tree. When roosting in the open, the tufts are more likely to be appressed (c.). A disturbance will often induce a roosting owl to stretch its body and raise its ears, exaggerating its cryptic aspect (d.). As a perceived danger intensifies, the posture shifts from crypsis to threat. The ear tufts begin to lower as the body feathers are erected, increasing the bird's apparent size (e.). As far as I know, all eared owls lower the ear tufts at this stage. Various vocalizations, bill-clapping and swaying may begin at this stage. In full threatening mode, the wings are spread and tilted forward, displaying the greatest possible surface area to the opponent(f.). The erect ear tufts in the sketch are typical of Asio (note how they wind up flattened against the wings). In Bubo and Otus they are normally (but not always) appressed in this display. Lifting the feathers of the facial discs so as to increase their area appears to be a more important part of threat display than anything done with the ear tufts. *Some authorities like to split this genus. I choose to ignore them. upper: NDUK EAGLE OWL (1995) acrylic 11" x 7"
second: HARPY EAGLE & TAMANDUA (1999) acrylic 20" x 15"
third: LONG-EARED OWL PORTRAIT (2006) acrylic 15" x 7"
fourth: SHORT-EARED OWL NEST (1983) watercolor 14" x 19"
fifth: BURROWING OWL & BADGER (1988) oil 30" x 18"
sixth: OWL ROOSTING POSTURES (2008) pencil sketch 11" x 8"
It's been over a week now with no sightings of toad tadpoles in the pond. I assume they were all eaten by the salamanders, who continue to grow at a moderate rate, without much morphological change. At this point I will stop with the weekly progress posts. Next one will be in August. My first kindergarten report card noted an extreme inability to compromise with my classmates, and the intervening 45 years have seen little improvement in my skills at playing well with others. As liabilities go, this isn't the worst one an artist can have; few occupations are more solitary. Nowadays, my cardinal peccadillo only seems to crop up when my work goes under the knife of a graphic artist. Above are four book jackets designed by graphic artists using my artwork. The two "wraparound" designs on the left are the work of Megan Davies, a graphic artist with a strong understanding of composition and color, in addition to a fluid use of her tools. These covers are the sort of uses I enjoy watching my work being put to. Both used existing paintings that weren't intended as book jackets. The painting on Biology of the Boas & Pythons appears in its entirety, while minimal cropping delivered but the slightest indignity to the painting on Rigor Vitae's cover. The original compositions are intact, and the text and overall jacket design serve to complement them. In the upper-right corner is a mock-up for a coffee-table book of my work from Abbeville Press that was never completed. 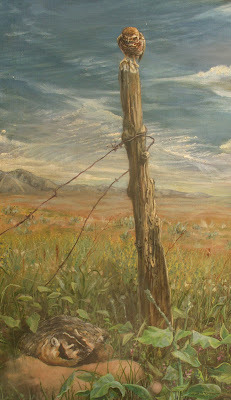 The original painting was flopped and severely cropped, presumably to concentrate the viewer's focus on the subject. Although the composition and feel of the original painting has been mostly lost, the jacket takes on a new, sort of Victorian look that's not altogether unpleasant. Unlike the other three, the painting on the cover of Frank DeCourten's Dinosaurs of Utah was intended as a book cover, and I left the graphic artists plenty of room to crop and add text. Designing artwork by committee can give the artist the unusual pleasure of working with alien inspiration. 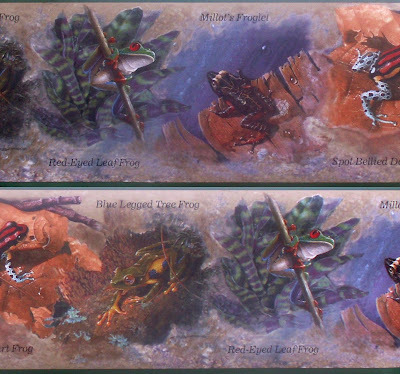 In 1994 I designed a dust jacket for Brian Kend's Pythons of Australia. The subject was to be a Bearded Dragon (Pogona viticeps) being constricted by a Black-headed Python (Aspidites melanocephalus). When I submitted my first rough sketch (above) to the publisher, he suggested a horizontal "wraparound" composition, an idea that would likely not have occurred to me. The ultimate design (below) was vastly improved by his advice. While designing the composition, I made sure that the right half of the painting would work in isolation, while the whole and the narrow, central spine (which features Australian red sand, gum trees, a kangaroo and python skin) work as well. 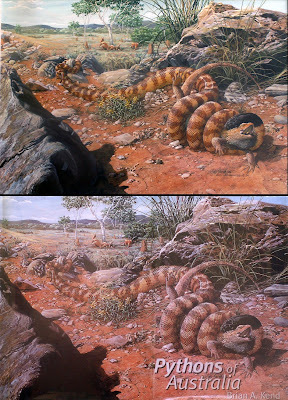 I also composed the painting on Dan Beck's Biology of Gila Monsters and Beaded Lizards (below) specifically for this purpose, working closely with the author. As usual, plenty of room was left for cropping, and the lower 1/8th of the piece was removed. Unfortunately, the graphic artist saw fit here to alter the painting as well, something that always rubs me the wrong way. Evidently, the depth portrayed in my original wasn't exaggerated enough for his liking, so the contrast was manipulated in the area behind the lizard's snout. For some reason, the treatment wasn't applied uniformly, with the result that the distant rock doesn't quite appear to be on a consistent plane. The change was subtle, but served only to lessen the visual impact. Below is an example of graphic artists using my work as elements with which to create something wholly new. Five of my illustrations (and pieces of others) from Dinosaurs of Utah were used for signage in the visitor's center of the Cleveland-Lloyd Dinosaur Quarry, with rather happy results. More often than not, though, I cringe at composites made from my work. Digital manipulation of art is so easy and versatile that graphic artists seem to feel like they're not doing their job unless they use some of those tools. The result is not usually good. Below is a particularly hideous wallpaper border made by chopping up and spitting out a series of frog portraits I painted in the late '90s. Greeting card companies are among the most egregious offenders. Sometimes I try to imagine the thought process that inspires their misdeeds. While flipping through images sent by art publishing houses, I picture a bored employee stopping at my Horsfield's Tarsier & Asian Frilled Gecko (above, left). "Here's an animal with big eyes. That's good. Too bad about the dark background - not very happy. We can fix it, though: zoom in a bit on the subjects and replace that macabre nighttime with an attractive marbled pattern." The new, improved image is on the right. My painting of an African Spotted Eagle Owl (Bubo africanus - above, left) got the treatment as well: "Owls are popular. We'll have to drop out that background, though - why does this guy keep painting nocturnal animals at night? - let's use the purple marbling this time. We can draw in some sweet little twinkling stars - those big ones he put in have to go - makes the crescent moon look too Islamic. We'll cut it down to a decent size, so you can focus on the owl, and just paste the moon onto the new background. Does the shadow on the moon look a little dark to you? No? Great, let's send it to the printers." We'll have to settle for an abbreviated post this week. 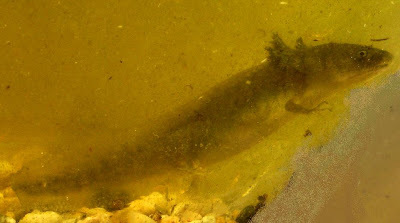 I couldn't find any toad larvae in the pond today, but the salamanders have acquired the standard "axolotl" form. It's time to update my post from a couple of years ago about the shifting local populations of ravens and crows. Common Crows (Corvus brachyrynchus) colonized Salt Lake City just seven years ago, and Ravens (C. corax), common denizens of the deserts to Salt lake's south and west, began to nest in small numbers in the city around 1980. Over the first three years, the crow population rocketed to a few hundred birds before seeming to level off around 2005. Ravens, on the other hand, have never numbered more than a few pairs in the city itself. I grew up in the Wasatch Mountains east of Salt Lake, and never saw a Raven in the Wasatch, north of Utah county, until last year's Blogger Bioblitz, when I watched a pair emerge from a draw to stoop at a passing goose. A thorough search of the area failed to yield anything, and I assume they failed to nest there. This past week, another pair (perhaps the same one) was observed on multiple occasions in the next canyon to the south. So far, I've been unable to locate a nest. The past week hasn't added much length to my amphibian larvae. The Barred Tiger Salamanders (Ambystoma mavortium)have increased by about half a centimeter, the Woodhouse's Toads (Bufo woodhousii) have shown no visible increase, although their morphological change has been striking (above). The front legs, virtually invisible last week, are well developed, and the hind legs continue to grow. The body has taken on a new spotted pattern and the head shape is altogether more toad-like, with protrusions at the eye and jawline developing. I can perceive no morphological change in the salamanders over the past week (below).